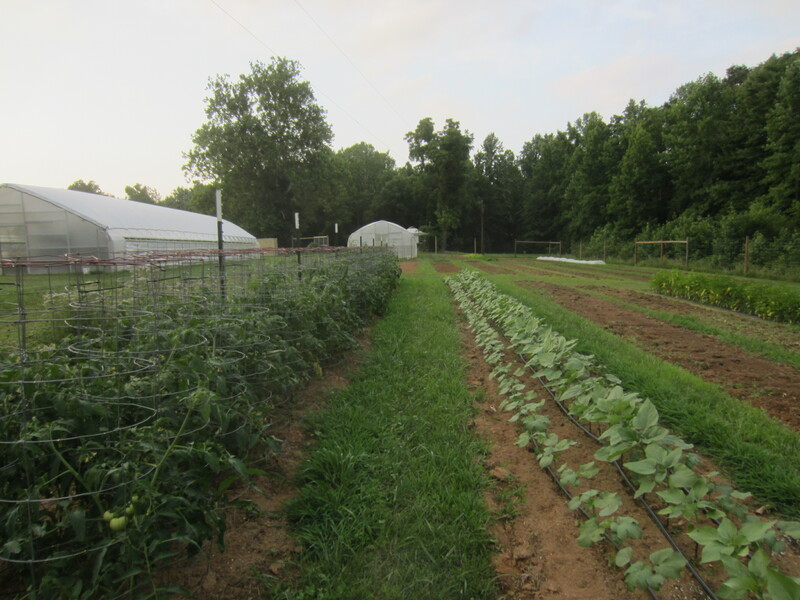 Here’s a little glimpse of what’s been going on over the past six weeks on the farm. Lots of tomatoes! 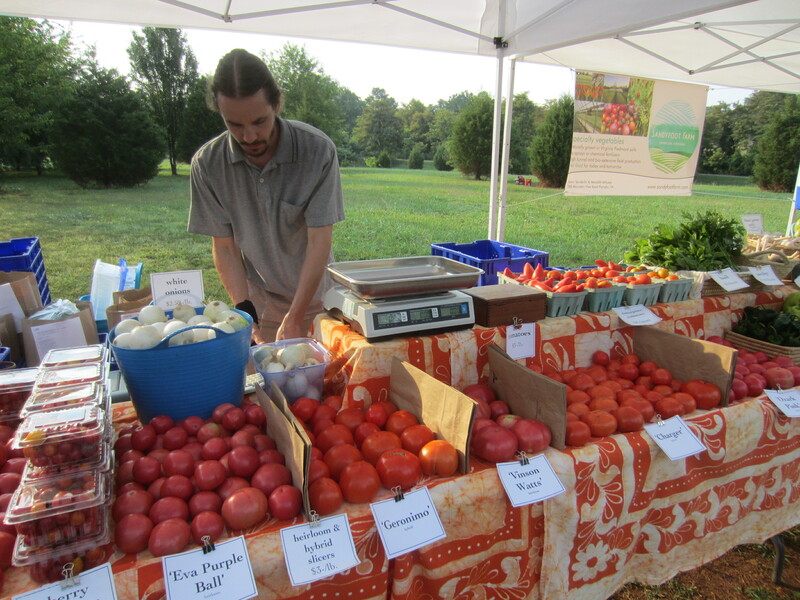 Our tomato crop came in earlier than ever, but it has also been our shortest crop ever. 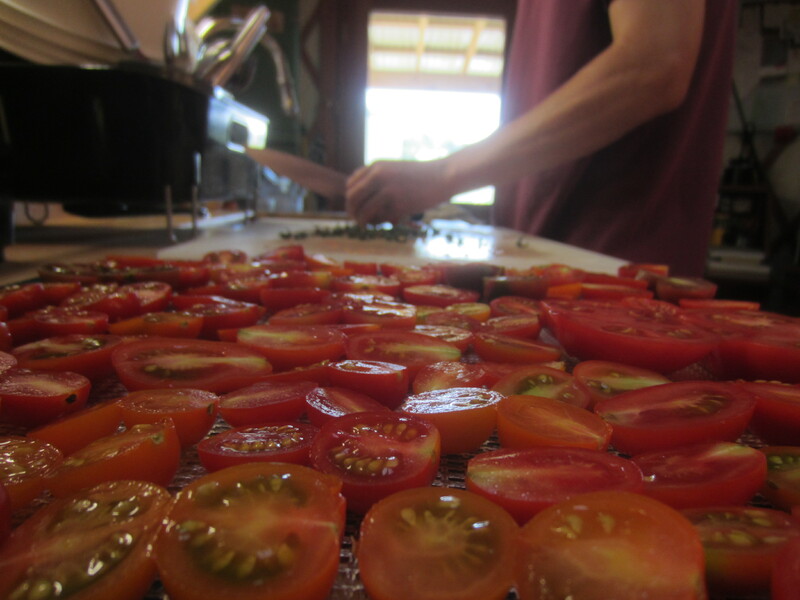 We did manage to make dehydrated tomatoes and freeze plenty of roasted tomato sauce for the winter. Even with all my extra management and grafting this year our tunnel tomatoes came down with leaf mold and yields have suffered dramatically. 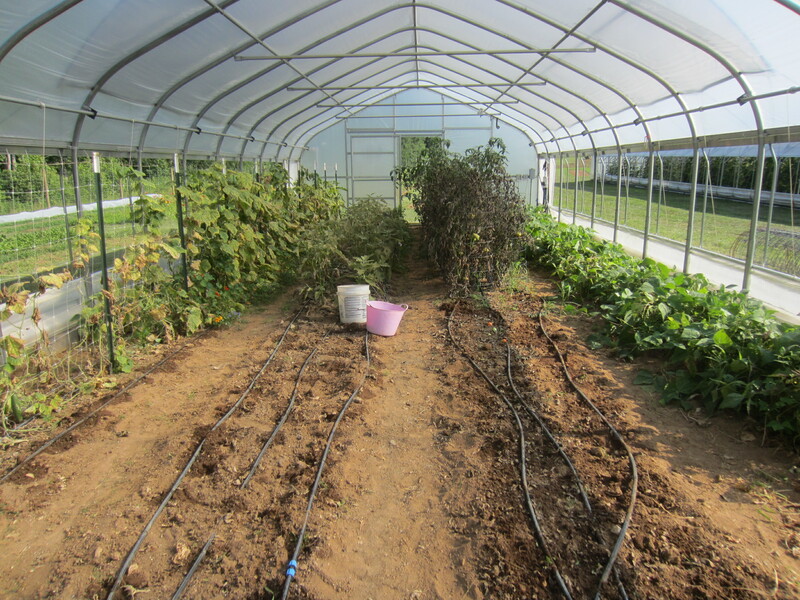 The tomatoes in the little tunnel were really hit hard and we pulled them out by late July! 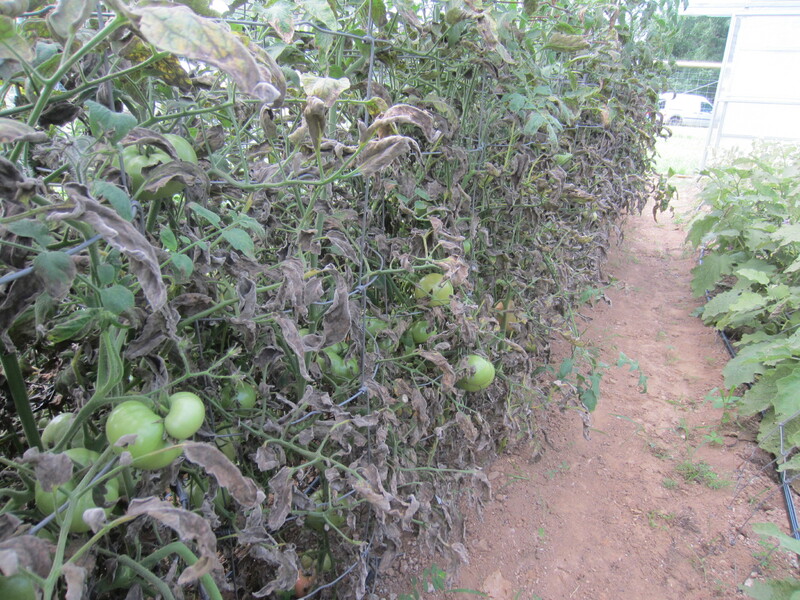 Might have been blight or one of a plethora of other diseases that strike tomatoes. Recommendations for protecting your tomatoes and potatoes from blight include spraying them with copper: this is supposedly the ‘biological’ recommendation. Sorry, but I’m not going to spray my FOOD with HEAVY METALS!!!!!!! So out came the tomatoes. Luckily all the other crops in that tunnel were at the end of their life as well so we were able to do a total clean out. And tried to prevent future disease outbreaks by solarizing the soil… using the heat of the sun to disrupt disease and pests. 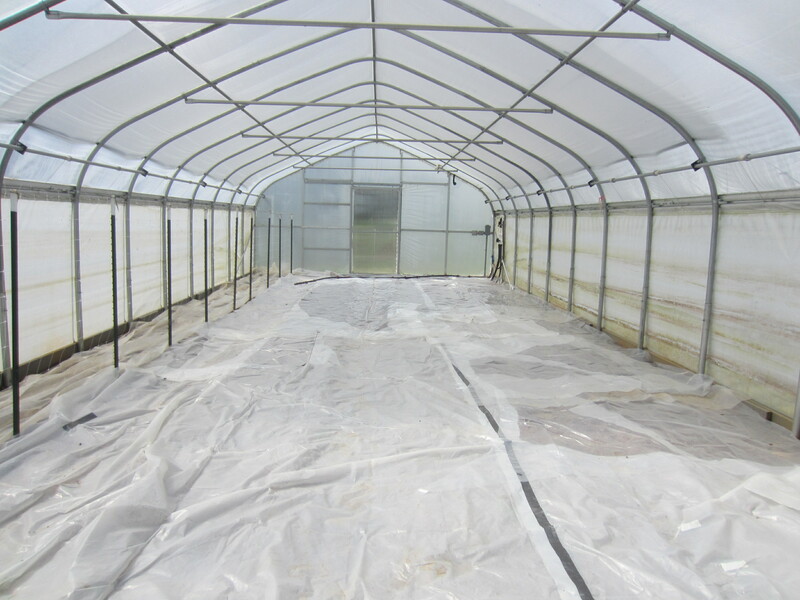 Not sure if it will do any good, as we only left the plastic on for a few weeks, and the soil temperatures did not get very high. We’ll see what happens next year. 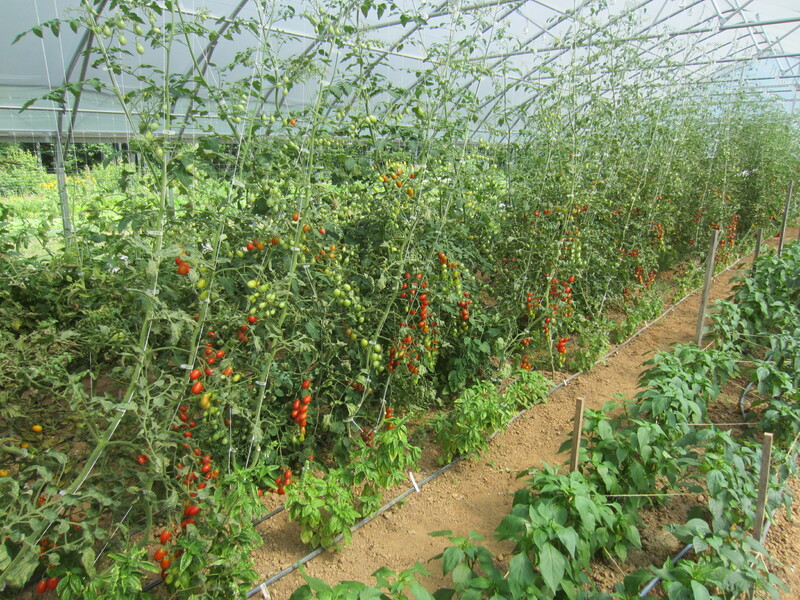 But this experience has got us re-thinking our tomato-planting strategies as well. Our previous mantra was ‘never plant tomatoes outside’. Never say never. At any rate I decided to put the late tomato planting outside, since it was already showing signs of leaf mold, and putting it in with the other tomato planting would have meant premature death for sure. 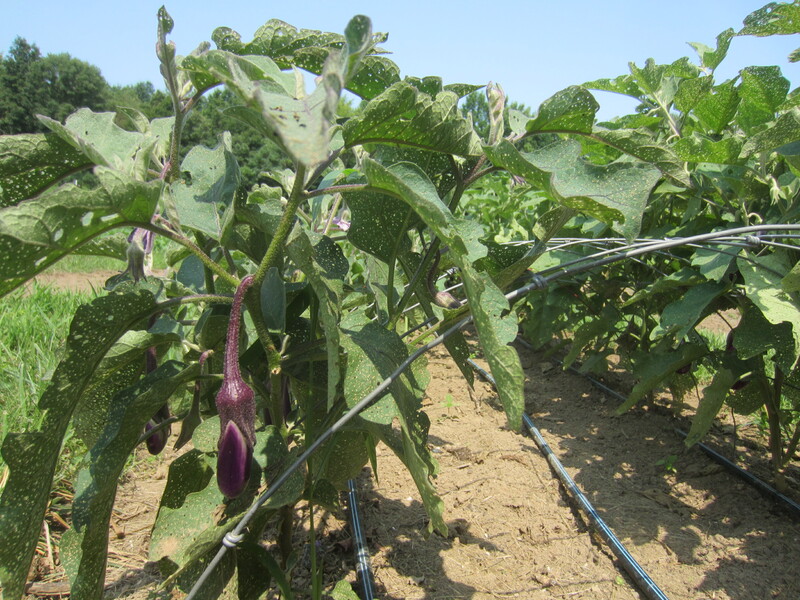 Our planting of eggplant also suffered in the tunnel but luckily we had an outdoor ‘overflow’ planting which has finally started producing, and looks great. So, I’m having second thoughts about my ideas regarding the success of outdoor solanaceous crops. Our cucurbits have been amazing this year, and are just now beginning to show signs of downy or powdery mildew. Of course there are always the insects too. I think we’ve had our squash and cucumber fix this year and so has the market! 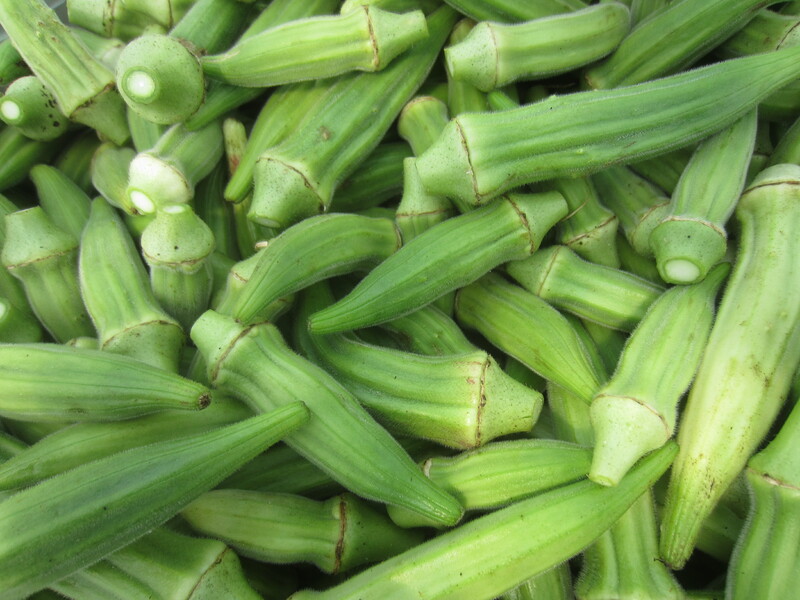 The okra plants are big and beautiful as one would expect, and also highly attractive to the Japanese beetle population. It’s the leaves they prefer; they leave the pods to us. 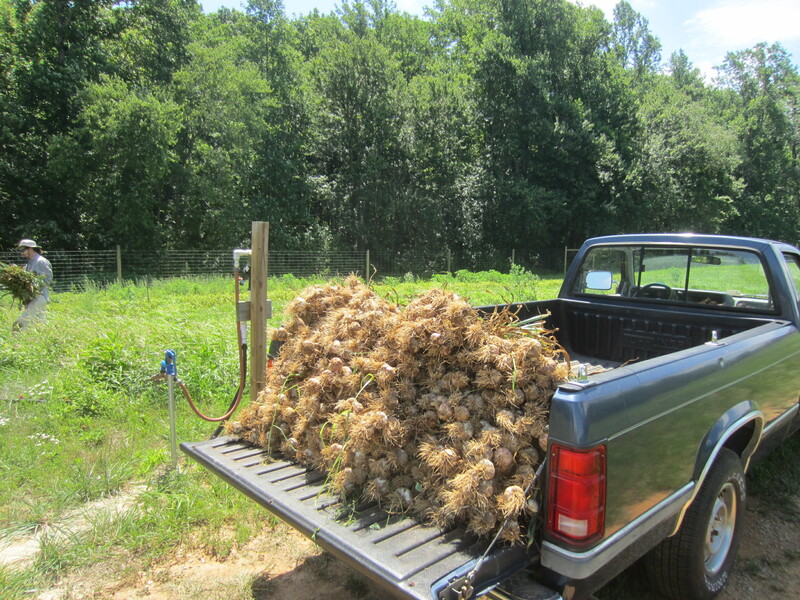 We had a nice crop of onions, except for the several rows I lost to the weeds. 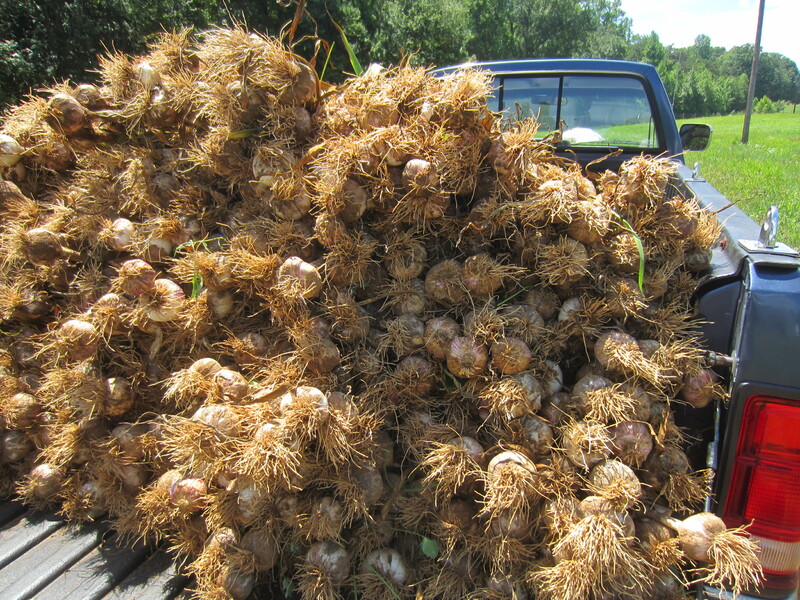 And we harvested all our garlic, which has been curing now for a month in the potting house. One lesson I’ve definitely learned this year is about varietal selection. Reading the descriptions in the catalog only gets you so far but after you grow the crop you can really understand what was meant… We had a few varieties of tomato that were resistant to leaf mold that are doing spectacularly, growing beside other varieties that are not resistant, and those are completely melting down. 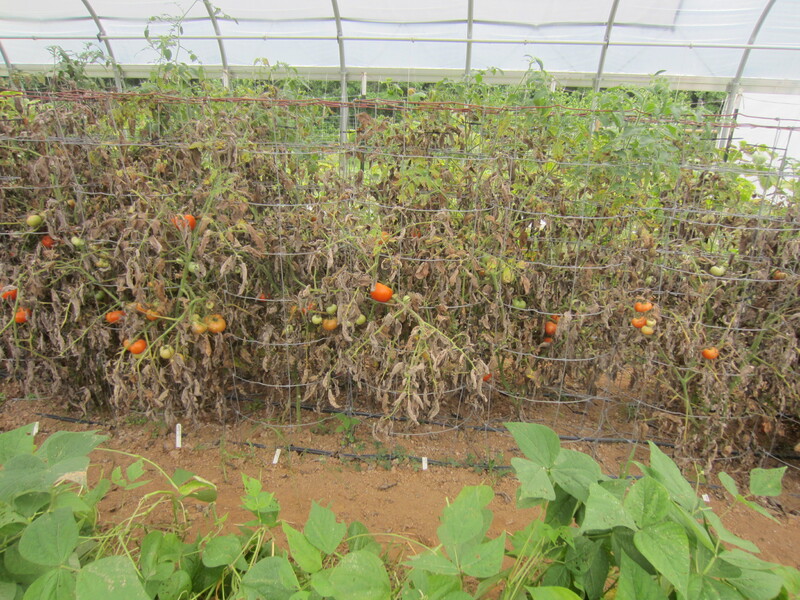 After going through and looking at what varieties I am growing and their specific disease resistances, I could clearly see the problem was leaf mold, which is apparently a common problem for tomatoes in high tunnels. 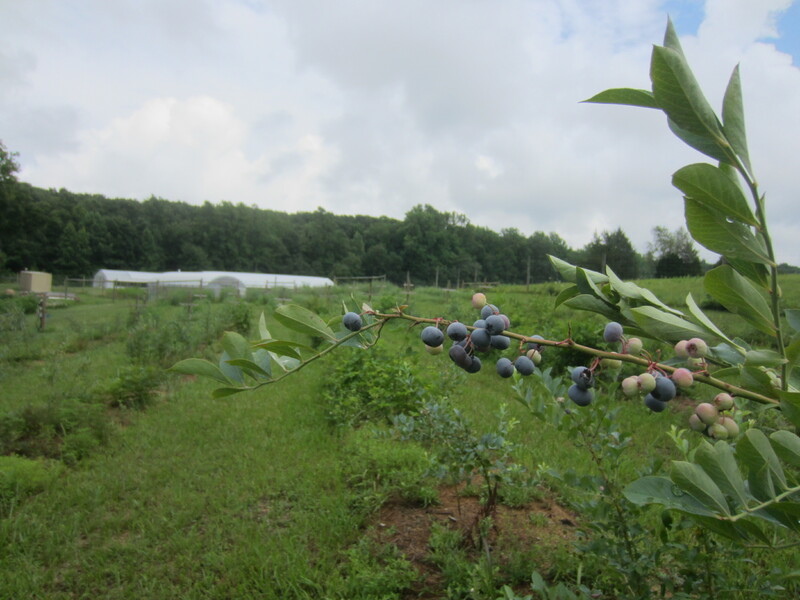 Our blueberry planting is finally showing promise. Now if we can just keep the weeds down. The sawdust mulch helps tremendously but it still needs work. A lot of work actually. We’ve had issues with a disease called celery anthracnose or leaf curl this year. 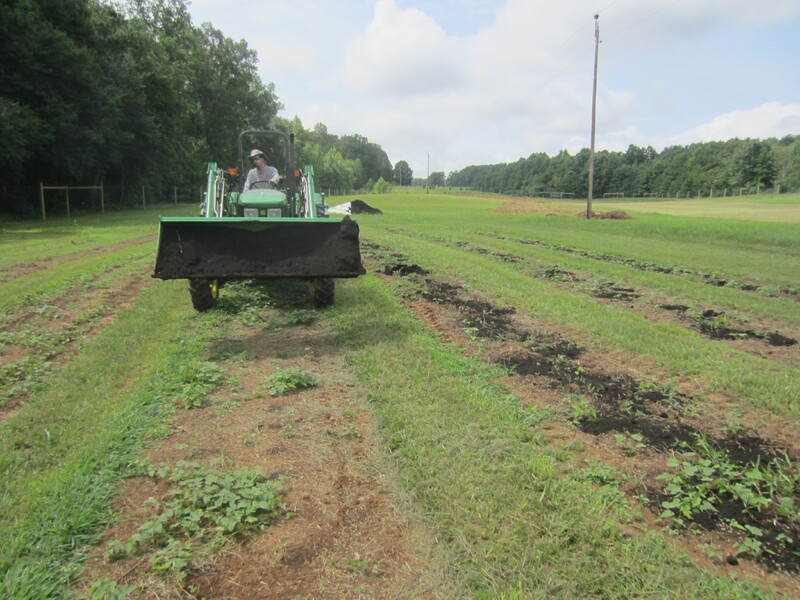 It has caused about 50-75% losses of our celery crop. Good thing I overplanted the celery. 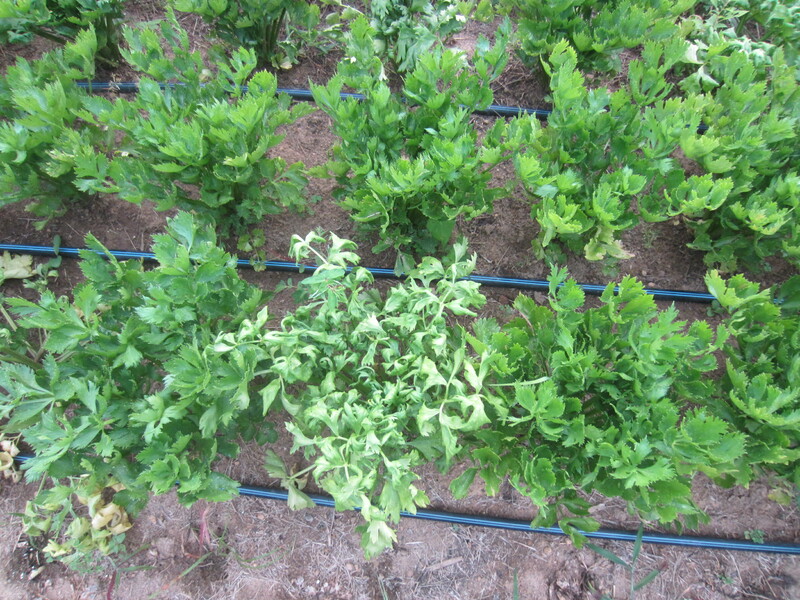 Other diseases of celery we’ve experienced are blackheart and aster yellows. And folks wonder why this isn’t a typical garden crop? 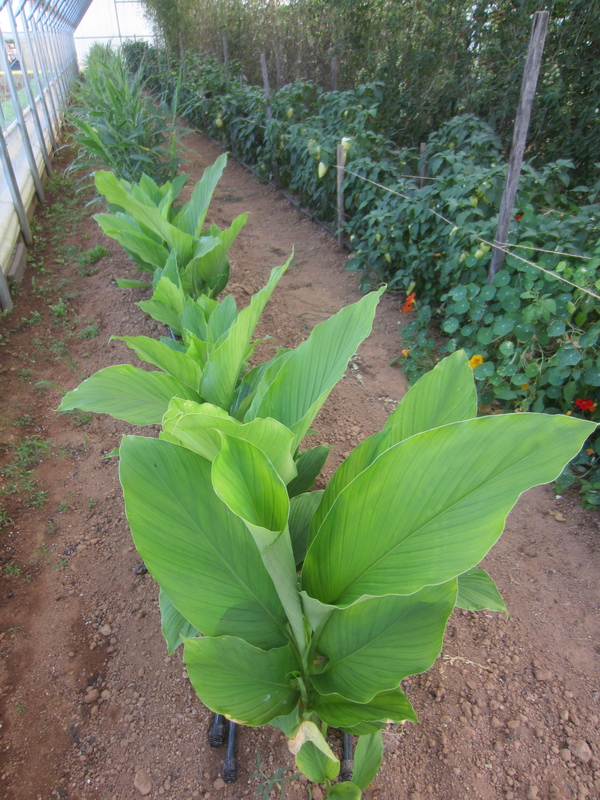 Speaking of non-typical crops, the ginger and turmeric look awesome. Can’t wait to sample the goods, in another six or seven weeks! 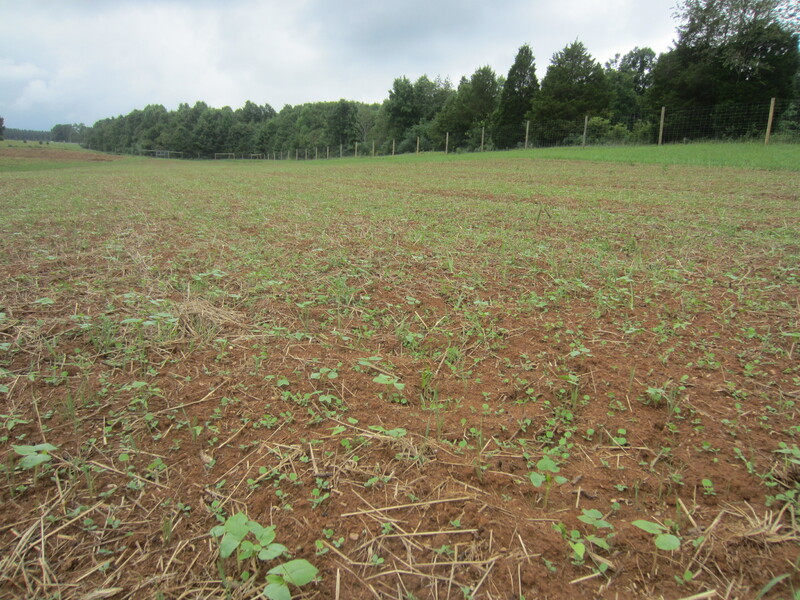 We’ve made major efforts over the last several weeks to get our fall plantings underway and in the ground. 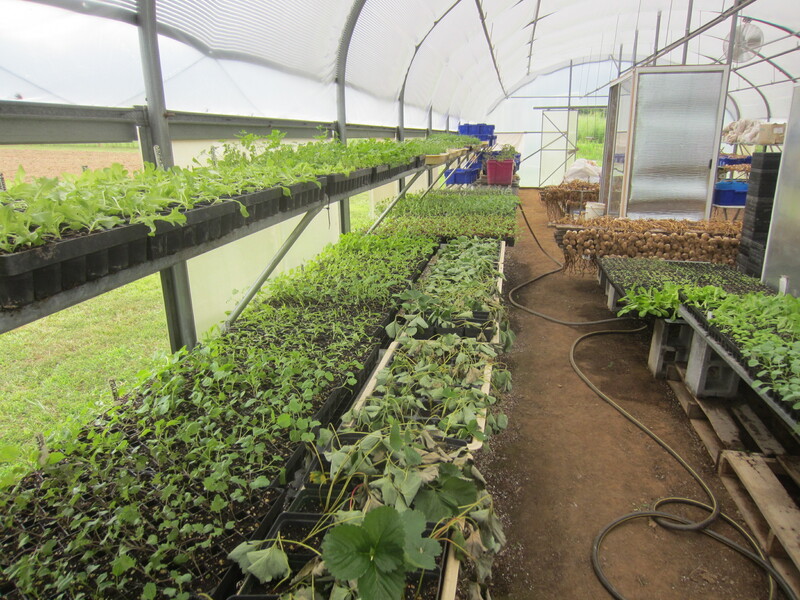 The potting house is full of seedlings again and we’ve spread compost on the fall beds. This week I’ve moved many out into the soil! Other progress has been made on new field preparations. 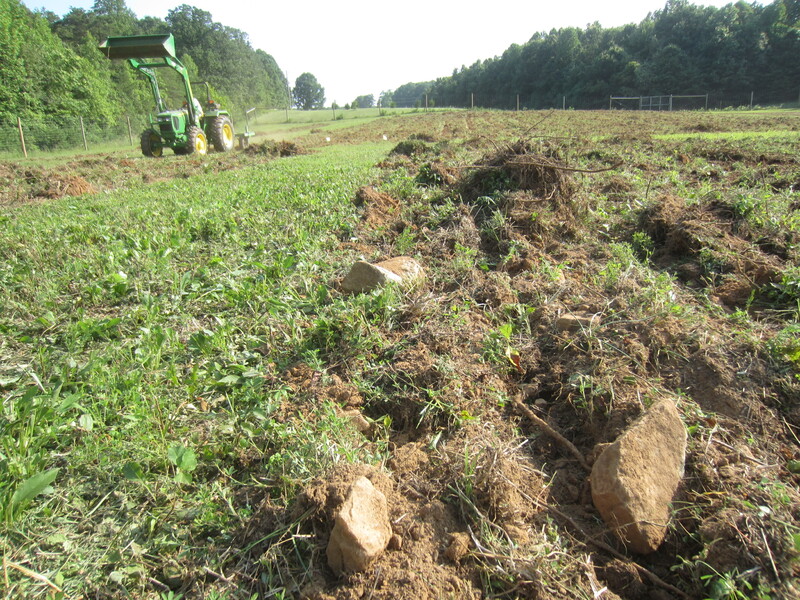 Gavin plowed the new sections… and there are lots of sumac roots and rocks to contend with. We need a rock crew to come and pick up all the rocks! Lots of roots. 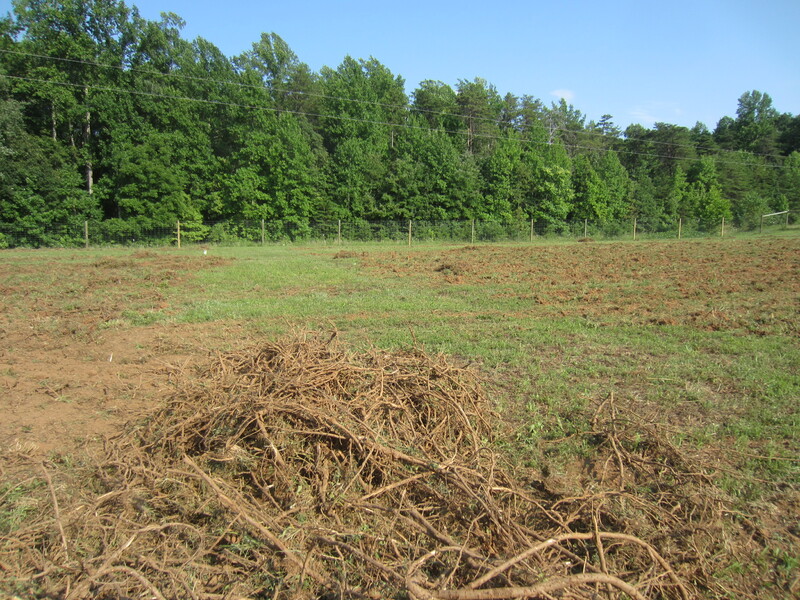 Maybe we could start a sumac nursery? Their fall color is superb. Ha ha. On the other side of the ditch this field got re-seeded to buckwheat and rye for a quick summer cover, also trying to grow out more of the annual weed seed bank. Gotta love it when you plant something right before a rain! We had the most amazing weather in July. There were only a handful of days that were uncomfortable due to the heat. Which is unheard-of for a summer in Virginia! 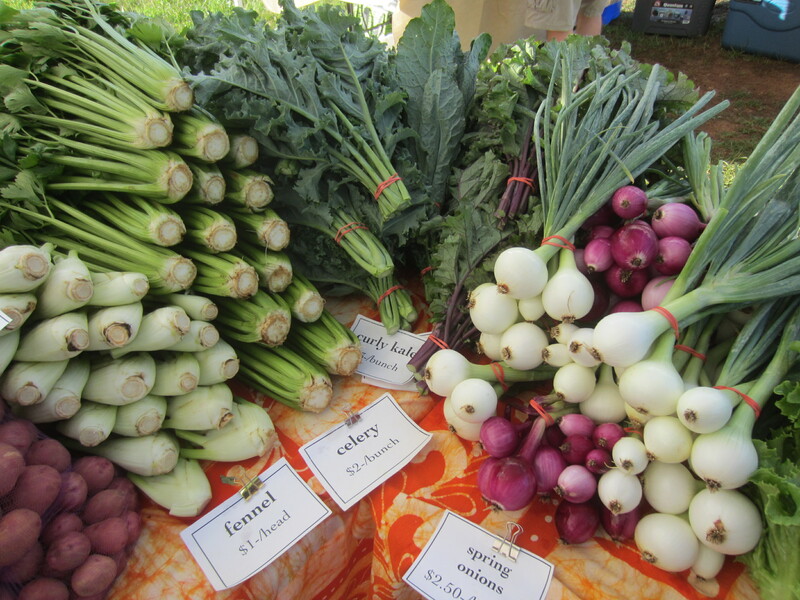 …and some of the beautiful, delicious, and completely spray-free foods we brought to the market! Nicely described as the good, the bad and the ugly……..and thankfully those beautiful veggies for market to see the other side. There are so many different aspects to consider when doing this work that I hadn’t realized. It sure isn’t just planting a seed and hoping it will grow! Your work is admirable. Have you tried corn meal tea to control the mildew? Also a little Baking soda mixed in water and sprayed on is suppose to help. 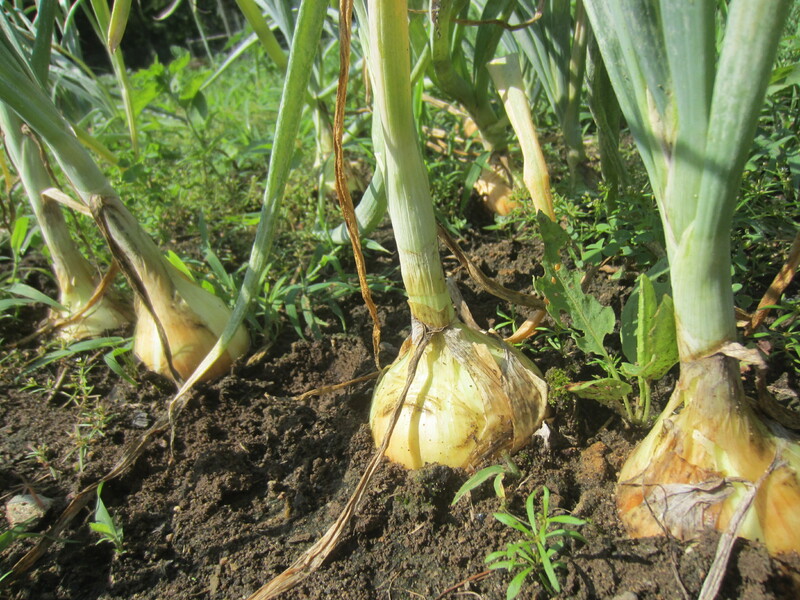 Do you do companion planting of herbs around the veggies to help control bugs? 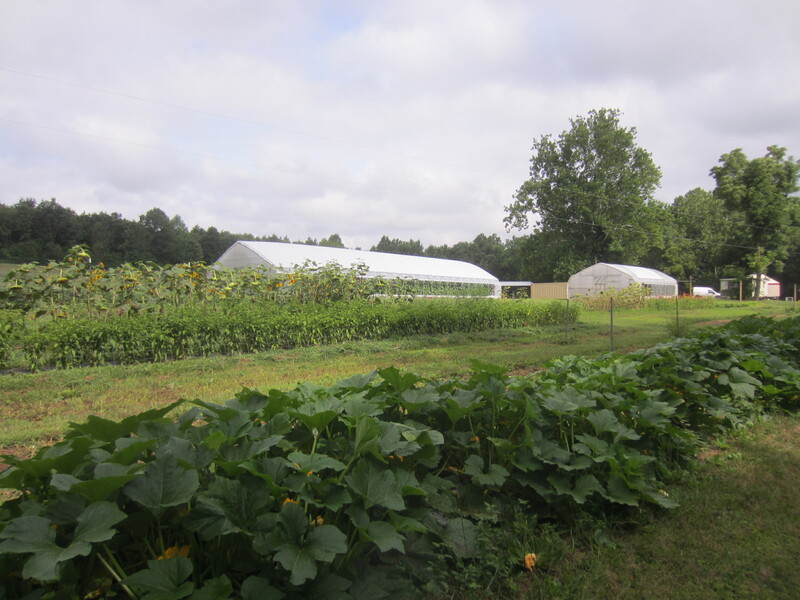 We have done some companion planting, and also farmscaping, as well as having diverse borders around the fields to encourage beneficial insects. It really helps. No, I haven’t tried any sprays, as we are opposed to using therapeutic sprays, even those that are allowed by organic standards. If my plants can’t hack it I need to fix something with the soil, the cultural conditions, or the variety. Planting over 100 different crops helps to even things out and you’re not so dependant on any one thing succeeding. Love all the photos and the commentary. 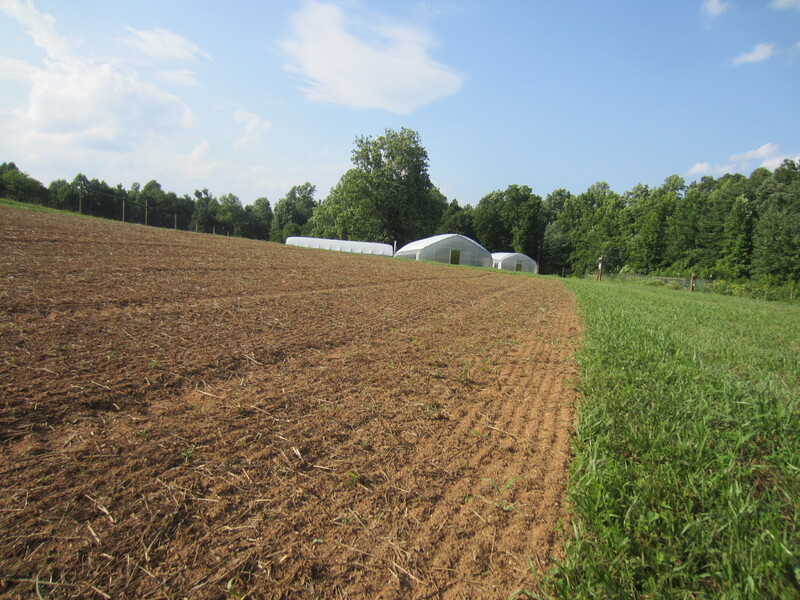 We don’t have high tunnels yet, so it is good to hear the good and the bad about them. Our field tomatoes are a gigantic experiment this year as we lost everything to blight last season. I’ve chosen several heirloom and hybrid varieties with big lists of disease resistance. So far, the plants look great. Only issue is that the fruits have been green…FOREVER…seriously, it has been over 3 weeks. My early variety is ripening but is suffering from blossom end rot. Certainly could be uneven watering…but most likely it is due to calcium levels in the soil (we are getting another soil test this fall). 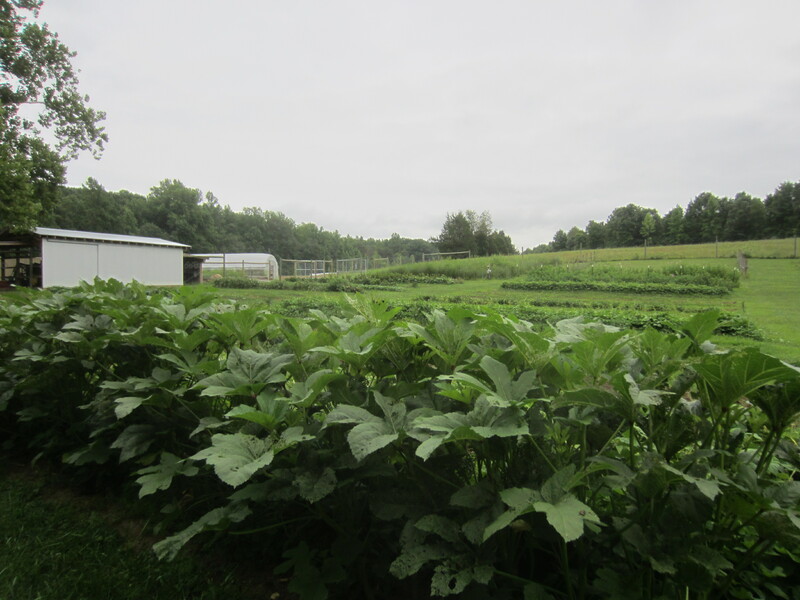 Our squashes are starting to ebb…did not do additional plantings for a similar reason…just get tired of them. 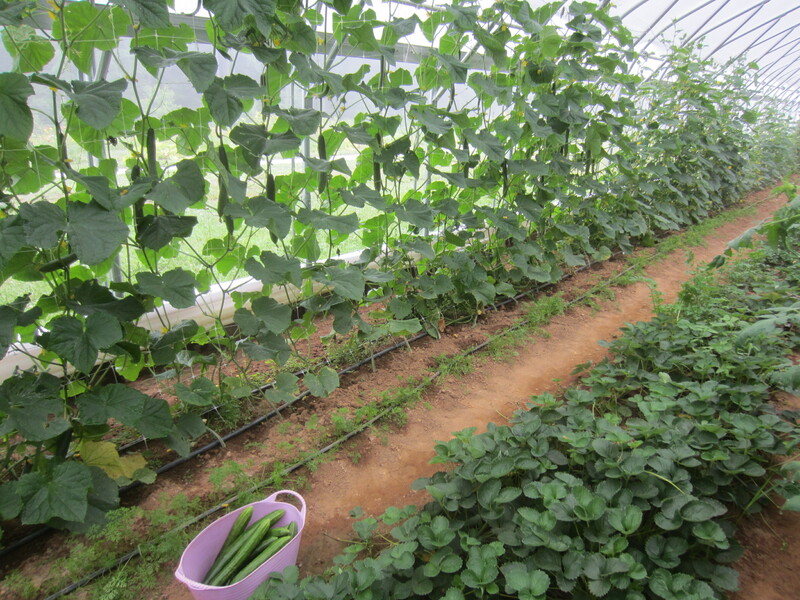 The cukes are peaking, but I am seeing powdery mildew starting. 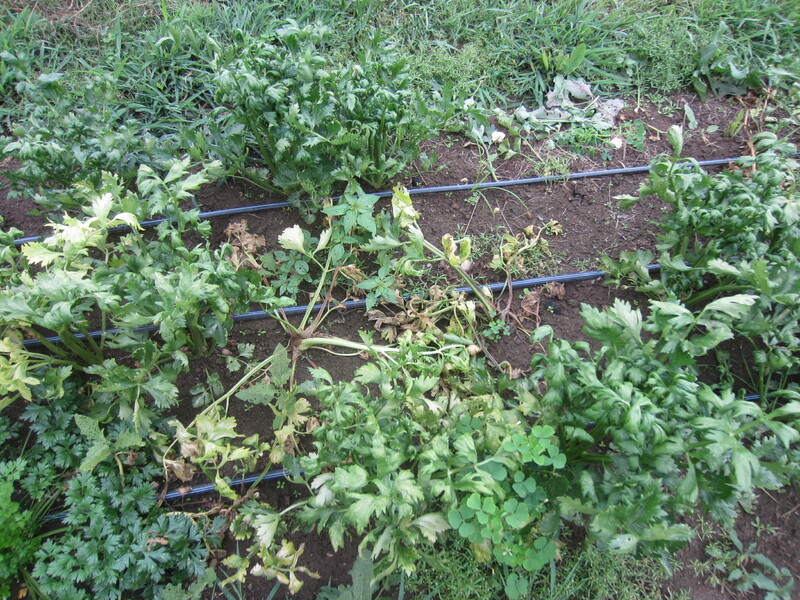 I am pulling our kales because of pest pressure (harlequin bugs). I am with you Meredith. Why spray ANYTHING? Copper accumulates in the soil. No thank you. Pyrethrins are natural, yes….but they are too effective and kill beneficials. No thanks. I love my honeybees. 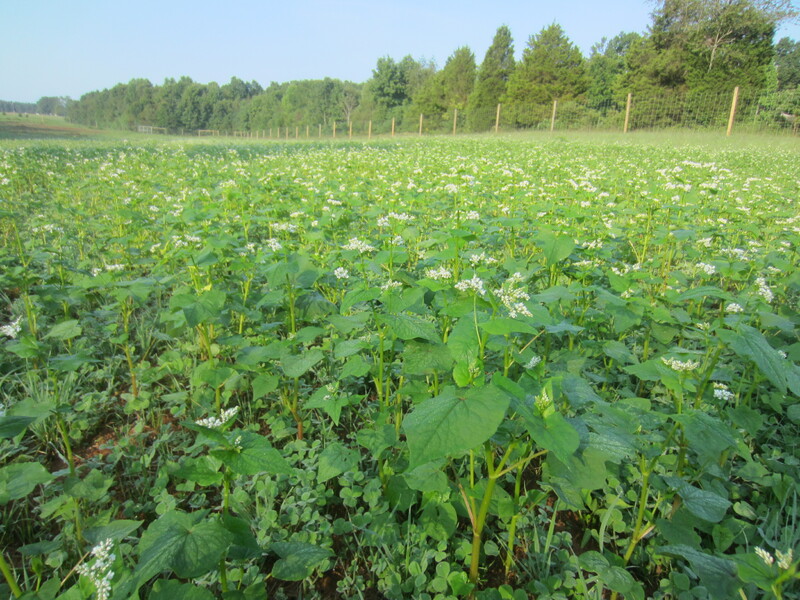 Companion planting and farmscaping have helped us a lot this year as we have seen a dramatic increase in “good” bugs. Out of control for us are the cabbage worms, harlequin bugs and Japanese beetles. Surprisingly, have seen very few squash bugs (companion planted with nasturtiums and/or radishes), cucumber beetles (nasturtiums), Colorado potato beetles (row covers). Bean beetles are just making an appearance. I’ve jinxed myself on all of these now, I just know it. Thanks for posting! Hope your tomatoes ripen soon, Amy! It might be a good thing coming in late, you never know how the tomatoes on other farms are doing and yours might be timed just right. We seem to always see blossom end rot somewhere, tomatoes are a complete pain. I did have a few grafted tomatoes that got set outside from the early planting, and they’re doing very well, so I think that might be a promising direction to go in for next year. My goal for the cabbage worms and harlequin bugs is to always keep brassicas covered. 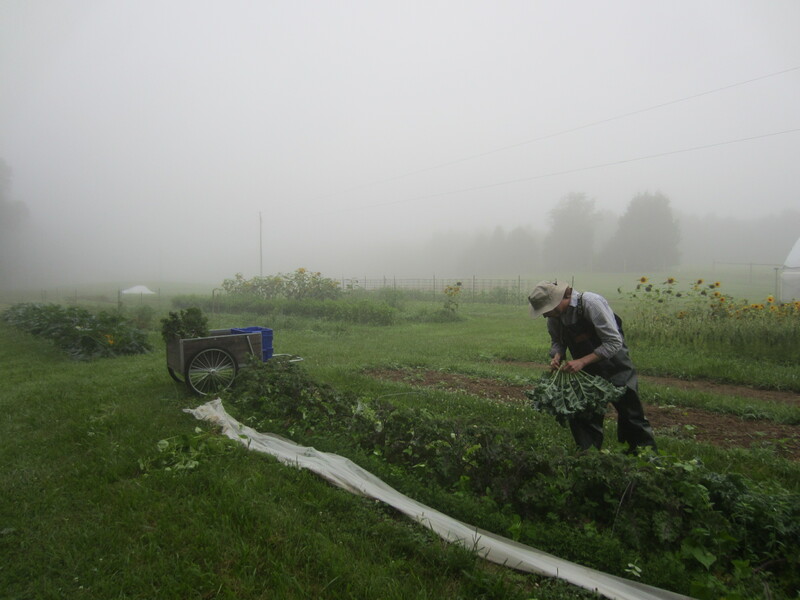 The netting is working pretty decently, and we also take a break from brassicas in mid-summer (to deal with pests but also because they just don’t do well for us then). Sometimes the cabbage worm butterflies still get under the netting, and there always seems to be a rogue butterfly (moth?) who finds his way into the potting house and lays eggs on all my fall brassicas, which I have to then spend lots of time finding and squishing before setting the transplants. At least it’s easier to find the eggs than to squish the caterpillars once they emerge. Need to work on an exclusion chamber for fall transplants, for next year. At any rate, I need to email you, after I get some more of these fall plants in the ground, it was nice to meet you the other weekend! !